There is so much stuff in Maria Tomasula’s paintings. Gelatinous oyster meats, a downy hare, soft figs, speckled turquoise, and fluffy pink peonies gush and swell across the picture. Painted with realistic precision by Tomasula, a self-confessed “technique geek,” layers of glazes and tiny brushes create ripe textures that seem to welcome an extended forefinger and thumb. 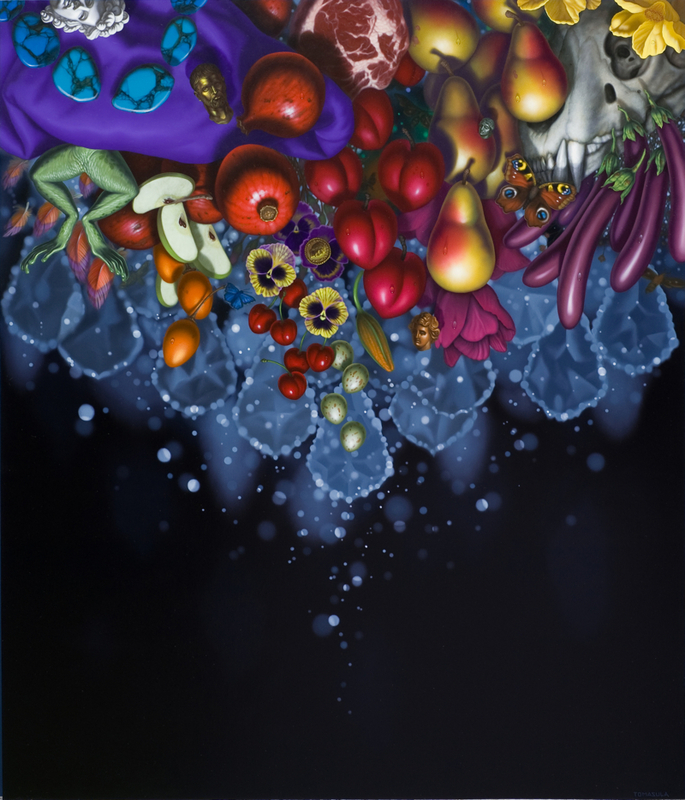 Tomasula’s paintings evoke the abundance pictured in the Flemish still life tradition, such as Frans Snyders who filled market carts with fresh kills, and their attendant morality lessons, where every mouthful of lush fruit could be the last. Indeed, our obsession with food keeps us living, but it’s the type of food portrayed by Tomasula and her host of inspirers that rings special. These are feast foods, showcases of luxury that stir the senses beyond simple nourishment. Glistening meats, lubricious orchids, candy-colored robin-blue eggs and silken mushroom caps—everything invites adjective overkill. This feast for a satyr, a Rabelaisian spectacle, offers a pleasure trip through a profusion of riches. Tomasula, who was artistically reared in Chicago and has exhibited here regularly since the late 1980s, currently teaches painting at the University of Notre Dame in Indiana. She notes that this is a long way from the working class immigrant Latino neighborhood where she was raised, in south Chicago, where her father worked for Inland Steel in a landscape that has since disintegrated, now called the rust belt. Tomasula’s Mexican roots are regularly invoked in reference to her painted subjects. It’s as if she used sacred hearts, household gods and homemade sorcery to produce a unique mix of vanitas and altars. Certainly Tomasula’s violet satins and blood-red roses lend themselves to such biographical explanations, as do the centerpiece meaty hearts and smiling skulls. She tells of her recent fascination with a marketing website that could determine the cultural and social makeup of someone who inputs simply their zipcode and age. Astonished, her marketing profile matched her actual existence quite well, as if all the seemingly unique strains of her life could be reduced to generic wants and desires. The paintings, then, are the products of long hours and infinitely tiny caresses of brushstroke, but they are not highly individualistic. Yes, the finery and goods tell of a certain class and social position, and they appeal to specific senses, but it is a collective dream of wealth that is depicted. Tomasula doesn’t hush the lie of originality that is whispered in our ear daily, but praises the triumphant illusion of individuality. What are we but stale dough thrown on the compost heap of days, rolling around to collect finger nail clippings, diamond dust, hollowed insect shells, skin cells, and loose coins? The hardening, darkening outer skin can be sloughed off with a hard metal brush, but the leftovers will be collected by the next rolling clump of clay.